Having already read Arlo Finch in the Lake of the Moon, I decided to go back and read the book that kicked off this series. 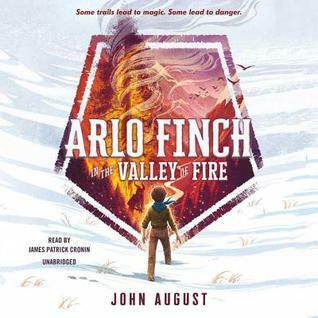 While I already knew what had happened in Arlo Finch in the Valley of Fire—as the sequel frequently referenced it—I still appreciated reading the details myself. I had a few questions and concerns that I hoped this book would address, and only about half of them were answered to my satisfaction. Still, I did enjoy this Harry Potter and Boy Scouts mashup, even if it is literally that. In the sequel, I definitely got the Harry Potter vibe, but I fully realized the almost 1-for-1 influence of the J.K. Rowling series on this series when I read this book. Unsuspectingly powerful main character with a unique physical trait? Check. Overachieving female friend? Check. Somewhat bumbling male friend? Check. Different groups categorized via character traits? Check. All I’m saying is that it would have been nice to see something that wasn’t so entirely derivative of the Harry Potter formula. As it is, I’d recommend the Arlo Finch series to anyone who loves the Harry Potter series. While I also really enjoyed the infusion of the Boy Scout-esque “Rangers” to the Harry Potter formula, I’m still not sure I believe this book’s explanation for why most people aren’t aware of these supernatural happenings. Sure, they can’t be photographed, but when the uninitiated families of these kids are brought together for a Court of Honor where they hand out merit badges for “Wards” and other supernatural activities, I can’t help but think that the parents would get suspicious of what’s really going on in this organization. It’s kind of hard to keep all these magical things a secret when you’re giving out awards for them. A solid Harry Potter adaptation wrapped in the trappings of the Boy Scouts, I give Arlo Finch in the Valley of Fire 4.0 stars out of 5.